Somehow I missed the second book in Genevieve Cogman’s The Invisible Library series, but that didn’t stop me from quickly requesting this third book when I saw it was available. I realized pretty early on in the book that I’ve missed a thing or two from the second volume, but for the most part the characters and situations are described well through the story and we’re given the information we need to make sense of the current story. Alberich, a villain to The Library, has delivered an ultimatum — he must be given complete control of The Library or he will destroy The Library and kill Librarians along the way. The Library is very much like any other series of libraries, filled with books, but it is also a portal to other dimensions and The Library collects rare books for safe-keeping from many different dimensions. Being a portal to other dimensions means there are other potential repercussions should The Library system fall in to the wrong hands. But The Library tries to remain very neutral when it comes to politics and might. Irene is a Librarian, though she’s apparently been in some trouble and is currently on probation. But nobody knows the nefarious workings of Alberich the way Irene does and when Libraries are starting to crumble and Librarians killed, Irene may be the only one who can stop him. This was a tremendously entertaining read, with plenty of action. The entire climactic sequence was a true page-turning thrill-a-minute. Cogman keeps the reader on the edge for many pages. I remember enjoying the first book, but I don’t remember it being as exciting and thrilling as this read. Too often I’ll pick up a book that’s mid-way through a series and I won’t have a clue what’s going on. Here we get all the information we need to enjoy the story and because of that I WANT to go back and read the volume before this. The Library is a great concept for an urban fantasy and Genevieve Cogman is working it very well. This book is highly recommended for fantasy fans. Looking for a good book? 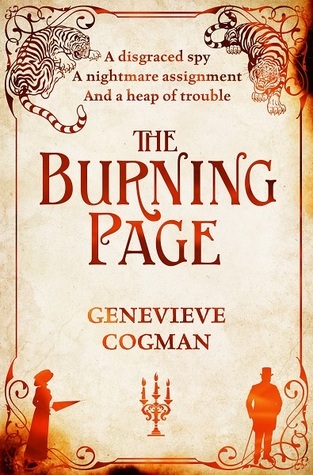 Genevieve Cogman’s The Burning Page is a thrilling urban fantasy that is a must-read.